Vecinos Films - The makers of Hypnotized and The Sound of Silence, the latest videos from Royal Plastic Music Group. Vecinos Films is a production company that is hungry for new proyects wich demand creativity and innovation. It arises from the society formed by César Camañas and Jordi López Hidalgo, the first tenants of the neighborhood in which form is given to the ideas leading them by the hand to mature and turn into images. Both neighbors are filmmakers experienced in the difficult task of getting the best from what they are given. The Co-creation is a must in the road from a script to the post production room and the neighbors count with an extensive network of Actors, Models, CGI Artists, Sound Designers ... to achieve incredible results as Hypnotized and The Sound of Silence. They would like to invite you to visit their neighborhood! I´m a filmmaker based in Valencia, Spain. In 2009 I obtained my degree in Audiovisual Communication at CEU-UHC. I took my first steps as a professional doing an internship at Vertigo Audiovisual working on the Tv show Selecció Natural. At this time I also had the opportunity to work as a freelance Assistant Director for Trivisión while filming Tv commercials. I trained After Effects with Jorge Mochón (Adobe Certified Instructor) and then I discovered that VFX were the way I felt more comfortable to start in the film industry. In 2011 I started working for Viajar y Estudiar in their marketing department. My duty was to create content for their youtube channel to endorse all social media campaigns. I´ve been there for almost three years and this approach to marketing has helped me to understand and gain experience in a new concept as is Inbound Marketing and find how this point of view can be applied to other areas of the filmmaking. That same year I helped to create Videópatas and I was part of the crew for one year. It was exciting but also really time consuming and due to my job I couldn´t be part of the project for longer. Now they have moved to Madrid and everything is going great. Good luck guys! During the last three years I have gained great experience working as a freelance editor, VFX supervisor and VFX composer in short films and music videos. 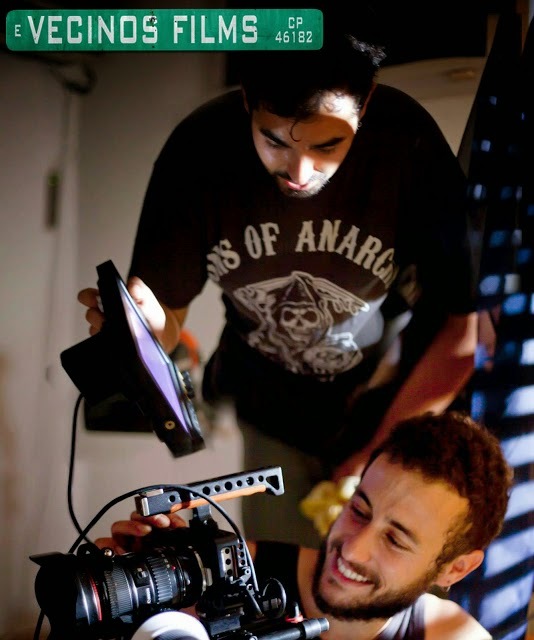 Now I have started my own production company called VECINOS FILMS with my friend and partner Jordi López Hidalgo. Our first jobs have been working with Tritón Media, Publips and Cuestion. I'm a freelance filmmaker specialized on DOP, video editing and VFX Composer. In 2008, when i finish my studies, i start my work in a Production Company called Tritón Media. There i made a lot of videos of any kind. Music Videos, Short films, advertising, etc. A very good oportunity to continue with my formation in the film industry. Works for Sony Music, Halo-Mega Blocks, Fermax, Hello Kitty, Potens Plastianmation, etc. In 2010, Akana Studios Films hired me as director, DOP and video editing. In this company i increase my experience in the advertising market. After all those experiences I decided to become a freelance worker and be able to freely choose in which projects I would like to be involved. The VFX Compositing of 'Molecular Zombi' in Tritón Media was the most remarkable project in this period. A year ago i founded Vecinos Films with my partner César Camañas and now we are living the amazing and hard experience of being entrepreneurs.